James Luxury 18 oz Scented Jar Candles by Jimmy Delaurentis feature rich, intoxicating scents and sleek designs inspired by Jimmy's travels to Italy and desire to envelop homes with a luxurious feeling and aroma. JIMMY DELAURENTIS is a design trailblazer with over 25 years of experience, Jimmy's unique aesthetic combines opulence with extravagance. He creates elegant and memorable items that reflect his unique style. 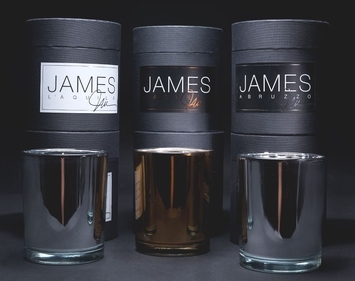 James Luxury 18 oz Scented Jar Candles are available in three distinctive fragrances: Harvest, L'Aquila and Abruzzo.